Global healthcare is currently in a very crucial phase of transformation. There is mounting pressure to reduce costs, improve quality and satisfy customers. The industry has been moving from a provider-driven model to a consumer-driven model. At the same time, the growing aging populations, increasing chronic conditions and rising awareness about healthcare is driving the demand for consumer-driven healthcare services. These factors are in turn generating demand for healthcare analytic tools to meet the high expectations. As the next step in the utilization of electronic medical records (EMRs) and electronic health records (EHRs) is to facilitate the meaningful use of data, analytics is a growing sector in the global healthcare IT market. According to BCC Research's Healthcare Analytics: Technologies and Global Markets (HLC187A), the market for healthcare analytics is estimated to reach a value of nearly $5.8 billion in 2015 and is expected to grow at a significant compound annual growth rate (CAGR) of 24% to nearly $16.9 billion by 2020.
Business analytics accounted for the largest share of the market for healthcare analytics in 2015 with 70% markeet share. This application market is expected to reach nearly $11.7 billion by 2020, at a CAGR of 23.7%. However, the highest growth is projected to come from the clinical analytics segment as the healthcare industry has placed greater emphasis on it than it had in the past. With the use of predictive analytics, clinical analytics is expected to be the driving force of the market for healthcare analytics. Major drivers of the market for healthcare analytics are U.S. government initiatives. The United States is a major market in terms of value and is driving the market for healthcare analytics with the Affordable Care Act (ACA), reimbursements and ObamaCare. In today’s world, technology is changing rapidly, while innovations are continually being discovered, and they are having a positive impact on the healthcare analytics market. With margin pressures increasing worldwide, analytics are looked upon as a tool to reduce costs. "Payer-provider convergence and rising healthcare costs along with the other market drivers are creating many opportunities that are boosting the healthcare analytics market," says BCC Research healthcare analyst Neha Maliwal. "These factors include EHRs increasing data volumes, the rising importance of value-based medicine due to peer pressure, health information exchange (HIE), easy to handle big data, emergency care and preventive care, time and cost savings, data clarity, and transparency and fraud detection." 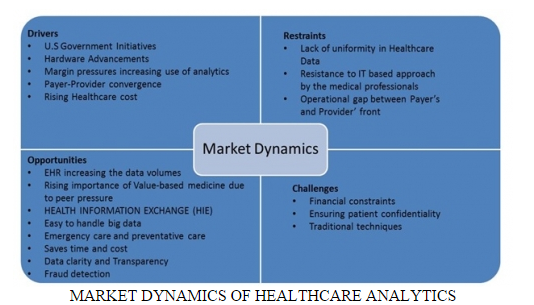 Maliwal adds, "The market is challenged by restraints such as a lack of uniformity in healthcare data, resistance to an IT-based approach by medical professionals, operational gap between payer and provider front, financial constraints, ensuring patient confidentiality and traditional techniques." The healthcare industry traditionally has generated huge amounts of data, driven by record keeping, patient care, and compliance and regulatory requirements. Although most data has been stored in hard copy form, the current trend is toward rapid digitization of these large amounts of data. Large amounts of data become big data when it meets three requirements: volume, variety and velocity. It has been reported that data from the U.S. healthcare system alone reached 150 exabytes in 2011. At this rate of growth, big data for U.S. healthcare will soon reach the zettabyte 1021 gigabytes scale. The biggest issue in harnessing big data is more than 80% of an healthcare organization’s data today is unstructured; physician’s notes, registration forms, discharge summaries and patient documents combined produce a mishmash of unstructured information. Big data in health data are sets so large and complex data that they are difficult, or next to impossible, to manage with traditional software and/or hardware; nor can it be easily managed with traditional or common data management tools and methods. Big data in healthcare is being used to predict epidemics, cure disease, improve quality of life and avoid preventable deaths. Big data will help and decrease inefficiency, clinical operations, research and development, public health, evidence-based medicine, genomic analytics, fraud analytics, device monitoring, patient profile analytics. As healthcare moves toward a greater focus on promoting wellness, there is an increasing awareness about maintaining a healthy lifestyle, fitness levels, and a proper diet. Today, numerous people are using wearable devices to monitor their diet, exercise, and number of steps. These devices are collecting a huge amount of data related to muscle activity, nutritional food intake, breathing -- even exposure to ultraviolent rays. Such wearable devices are affordable and reach a large number of people. The number of people using these devices will increase healthcare data many folds. Healthcare organizations are leveraging the data generated by these devices to improve healthcare outcomes. Indeed, physicians are now using patient-generated data to track patient’s post-hospital discharge in an effort to reduce the risk of infection and readmission; healthcare providers are responding more quickly to a patient’s health status as they remotely monitor chronic conditions; and health systems are better tracking and engaging their entire patient populations by integrating health data into patient engagement portals and EHRs. In addition, health insurance companies are leveraging data to create improved risk management models to better reward members; pharmaceutical companies are using the data to monitor clinical trials and conduct research studies on prescription drug side effects; and employers and corporate wellness companies are using verified mobile health data to create more productive and engaging health incentives.